Physical collection while bypassing device security. Uncover and reveal names, usernames, emails, and more in different sources on the device. Create full physical dumps from Android devices 25% faster than regular methods. Oxygen Forensic® software offers advanced physical extraction for LG, Motorola, Samsung, MTK, Spreadtrum and Qualcomm devices. This method enables lock screen bypass and requires no root rights. 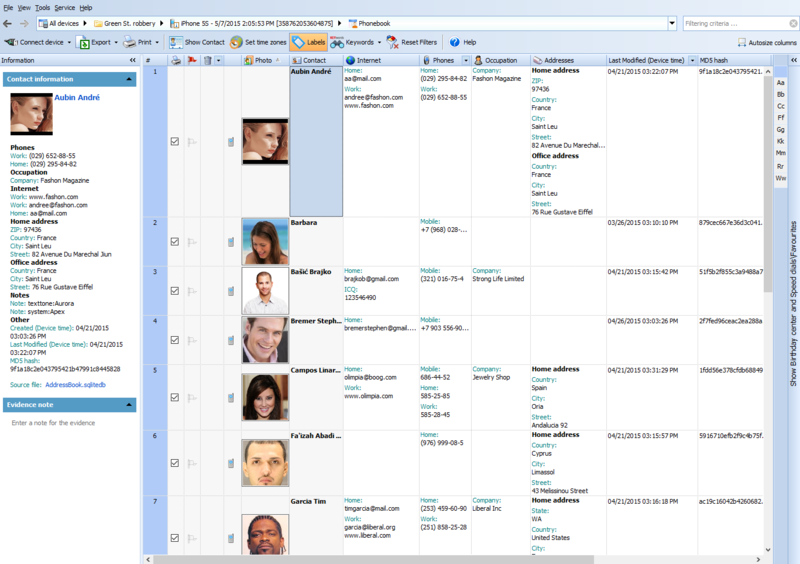 Aggregated Contacts section displays contacts obtained from various sources: standard phonebook, calls log, messages and application databases. Contacts with the same fields are merged into one meta-contact. Aggregated Data can be used at both the case level and device level of the examination. Due to the partnership with the MITRE Corporation Oxygen Forensic® Detective software offers the fastest physical extraction method for Android devices. 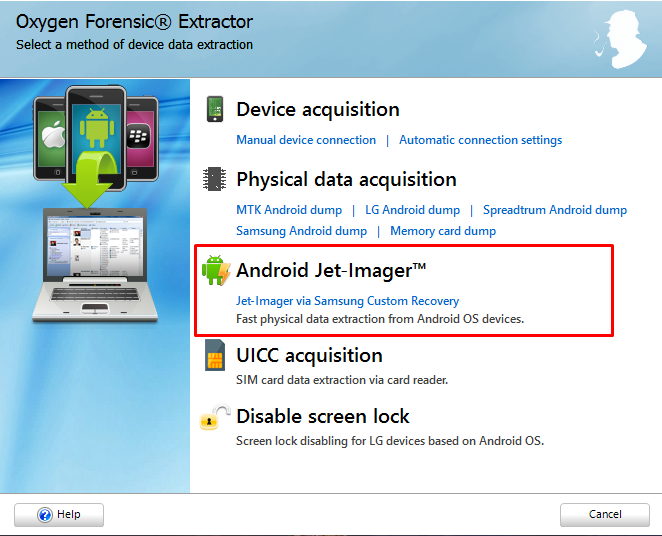 Thanks to the Jet-Imager module, Android devices are acquired up to 25% faster than previous methods . For example, a 16GB device can be extracted in 5-7 minutes, a 32Gb device in 8-10 minutes. The module has country export restrictions. Please contact our sales department for more information. Extract, decrypt and examine user data from today's most popular apps. Import and parse various backups and images made from today's devices like iOS, Android, and more as well as import from other forensic tools like Cellebrite and MSAB. The applications section displays user data that has been extracted and parsed from popular Social Networks, Messengers, Web Browsers, Navigation, Productivity, Travel, Finance, Fitness, Drone and Multimedia apps. Investigators can view app account details, contacts, messages, calls, logs, cache, and other relevant data. Even encrypted apps are decrypted and displayed in this area! Oxygen Forensic® software imports and parses dozens of various device backups and images created in official device software, third-party programs or other forensic tools. Investigators can import iTunes, ADB, and Nokia backups, JTAG/ISP,CHIP-Off and Nandroid images, XRY ,UFED, and full file-system images to name a few. The built-in Oxygen Forensic® CDR Expert allows importing and analyzing of CDR files received from mobile service providers regardless of the difference in their column formats and file layouts. The program conveniently guides the investigator through the process of call data records file importing and any field mapping that is required to convert the file into a unified format. 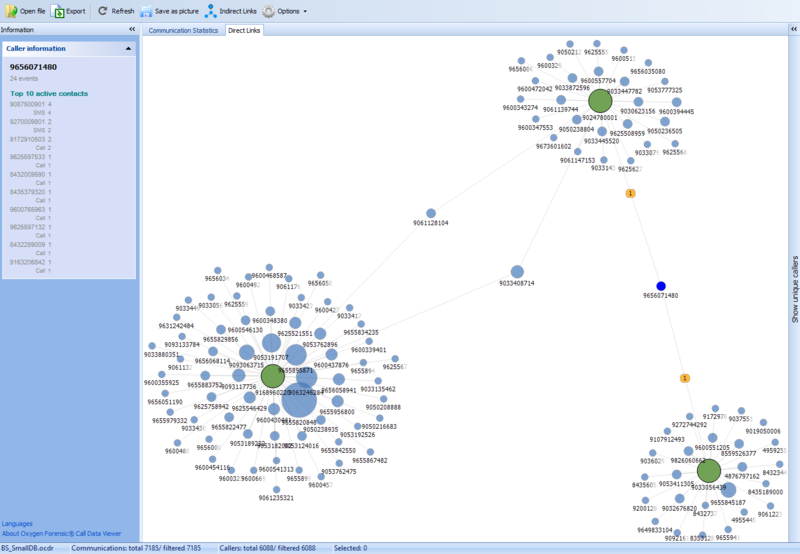 CDR Expert then visualizes direct and indirect links between callers on a graph. Gain access to cloud services like: WhatsApp, Telegram, iCloud, Google, Samsung, Microsoft, Facebook, Instagram, Twitter and many other social media cloud services. Customize and generate data reports in many formats like PDF, XLS, RTF, XML and HTML. The built-in Oxygen Forensic® Cloud Extractor acquires data from the most popular cloud services to include: WhatsApp, iCloud, Google, Microsoft, Mi Cloud, Huawei, Samsung, E-Mail (IMAP) Servers and more. Also, various social media services are supported to include but not limited to: Facebook, Twitter, Instagram, and many more. Investigators can use usernames and password combinations or tokens extracted from the mobile device to gain access to a cloud storage even when two-factor authentication is enabled on selected services. Oxygen Forensic® software enables the export of data from any section to many popular file formats including: PDF, RTF, XLS, XLSX, XML, and HTML. A report can be created to include a single device, several devices, several sections or even selected records. Reports are highly customizable to display only the data required, for any type of case. Our XML reports can be integrated into many popular analytic software platforms with our built in XML export specification documentation. Oxygen Forensic® KeyScout offers the ability to seek and locate tokens and passwords saved on a computer as well as in various desktop Web browsers, like Internet Explorer, Google Chrome and Mozilla. 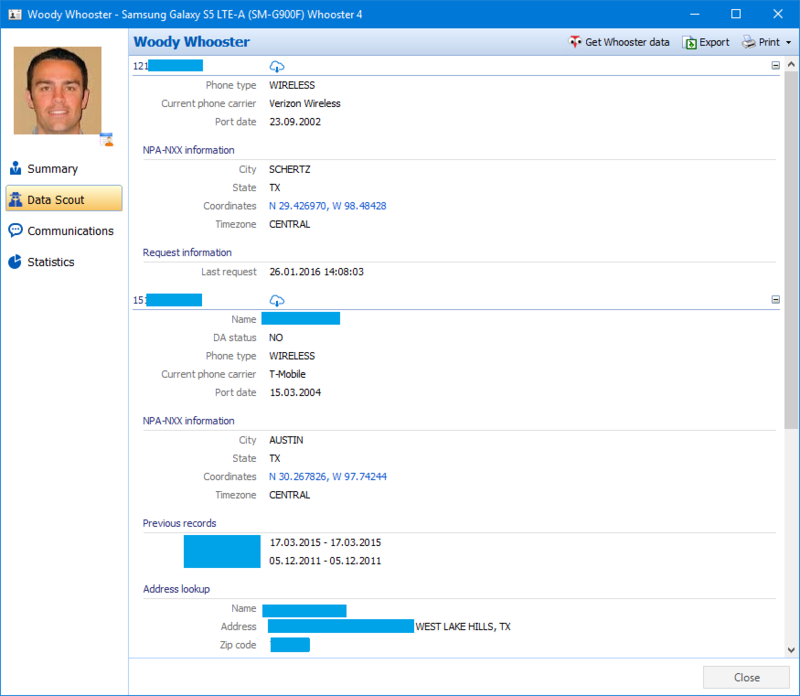 The utility is available from the Tools menu in Oxygen Forensic® Detective, installs to removable media and collects credentials currently from Windows PCs. 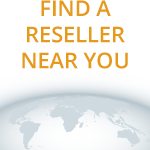 The collected credentials can then be imported into Oxygen Forensic® Cloud Extractor for immediate use. Powerful global search over a single device, multiple devices or entire case. Data Scout retrieves subscriber data from many extracted phone numbers. It interacts with the online lookup services of Whooster to gather intelligence information of collected phone numbers from mobile device extractions. The Data Scout feature currently uses the Whooster service and a subscription must be purchased with Whooster prior to enabling the Data Scout feature. Once the investigator's service credentials are received, they can be entered into the Oxygen Forensic® Detective interface to activate the feature. The service covers the US territory and Canada and is available to US law enforcement only. Oxygen Forensic® software has a powerful built-in interface for data search. Searching can be conducted on all devices, at the case level and at the device level. Investigators can search data according to the information entered in the input field, by keyword lists, hashes, using regular expressions or choosing any other available method. Search is launched as a separate process so investigators are free to work with the software during the search process. The search process can search within files to uncover data that has not been parsed, often uncovering valuable data within SQlite databases, log files, and property lists. Oxygen Forensic® software recovers a wide range of deleted evidence: contacts, messages, calls, notes, user data from applications from SQLite databases, It is also capable of recovering photos, videos, databases and files from physical images of Android and Windows Phone devices. All recovered evidence is marked with a special trash bin icon for easy identification.  Extract and analyze drone data from physical dumps, drone logs and mobile applications. Find passwords to encrypted backups and images by using various attacks and optimize the attacks to deliver unrivaled results in record speeds. The device information section gives you the general information about the acquired device. It shows various attributes, like the device specifics (e.g., make, model), SIM and network information, phone numbers and case details. Investigators can also find summary information of all the device owner’s accounts with login and password information for various apps and services. Oxygen Forensic® Detective can perform physical extraction of drones and parse GPS locations showing valuable route data in our built-in Timeline section and the built-in Oxygen Forensic® Maps. The software also allows the investigator to import drone log .dat files directly into Oxygen Forensic® Maps to visualize locations and track a drone route, as well as physically extract the internal memory on select DJI drones. Also available, data parsing from many drone applications, like DJI Go, for iOS and Android devices. And finally, the software allows to extract data from drone cloud services, like DJI cloud and SkyPixel. 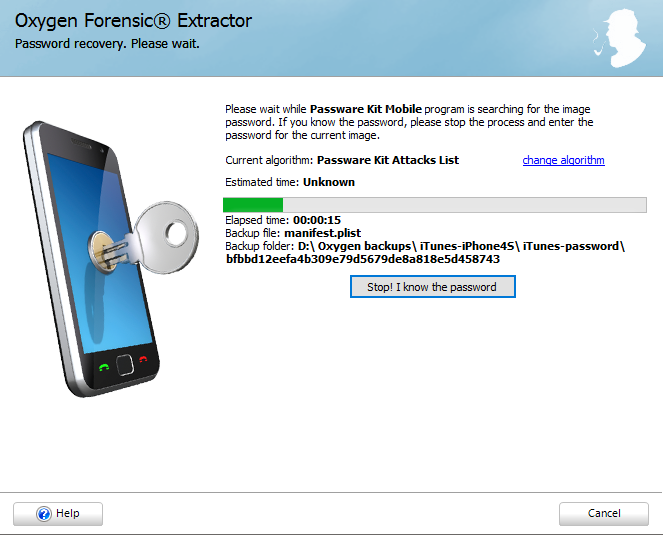 Oxygen Forensic® software enables decryption of iOS and Android backups and images. The built-in Passware mobile kit module helps to find passwords with latest algorithms and technologies including distributed processing and GPU acceleration with ATI and NVIDIA boards. The available attacks include brute-force, dictionary, Xieve, etc. and are highly optimized to deliver the result in the shortest amount of time. Access a devices photos, audio and video files, databases and other acquired evidence at the file-system level. View any file in a raw, hex mode, native view. The event Log section provides access to phone and FaceTime calls as well as messages and packet data. Investigators can apply time filters to view calls only for a particular period. The section allows to export all or selected data to PDF, RTF, XLS, XML and HTML reports. The File Browser section grants access to user’s photos, videos, documents and device databases. Built-in Text, Hex, Multimedia, SQLite and Plist viewers allow investigators to examine files and their metadata. Rich filtering and powerful search help to focus only on the required evidence. 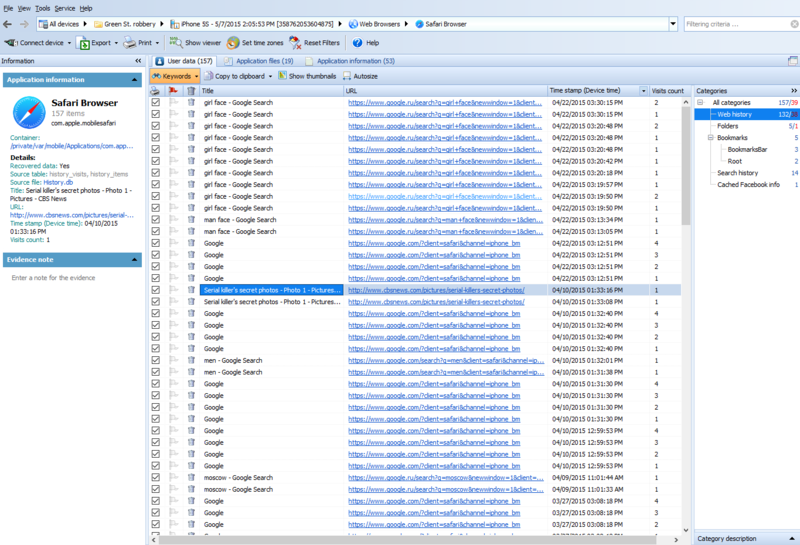 Oxygen Forensic® software collects geo data from various sources: photo and video EXIF headers, web connections information and applications databases. Geo coordinates can be extracted both from mobile devices and cloud services. The full list of geo points can be found on Geo Timeline tab in Timeline section. Oxygen Forensic® Maps can be also opened from this section to view the coordinates overlaid on a rich map view. The Key Evidence section displays records bookmarked in other sections by the investigator as important. The function of the section is to put the entries identified as evidence relevant to a case in the same place, making data analysis easier. Investigators can bookmark important evidence in one or several devices and export it later to one data report. Oxygen Forensic® software allows creating and using keyword lists to quickly find relevant case facts in a single search function. Investigators can enter keywords or import them from a .txt file before data extraction to receive the results once the extraction process has completed. Oxygen Forensic® Detective supports the two most popular digital assistants - Amazon Alexa and Google Home. You can access Amazon Alexa cloud using a username and password or token. A token can be found on the device's associated computer with Oxygen Forensic® KeyScout and used in Cloud Extractor. The software acquires a complete evidence set from Amazon Alexa, including account and device details, contacts, messages, calendars, notifications, lists, activities, skills, etc. Google Home data can be extracted via Google username/password or a master token found in mobile devices. Extracted Google Home data includes account and device details, voice commands, and information about users. Oxygen Forensic® software provides several tools to explore social connections between the device owner and contacts or between several devices by analyzing calls, messages and app communication activities. Investigators can use either a Graph or Diagram to view and identify social links, find common contacts and analyze communication statistics. Oxygen Forensic® software offers both logical and physical methods of device acquisition via a regular USB cable. The program supports thousands of devices running iOS, Android, Windows Phone, Windows Mobile, Blackberry, Bada, Symbian OS or having no OS at all (feature phones). Support for MTK, Qualcomm and Spreadtrum chipsets is also available. Additionally, you can extract and recover data from media and SIM cards via specialized readers. The built-in Oxygen Forensic® Maps module is available both in online and offline modes. Oxygen Forensic Maps allows investigators to quickly identify a user’s frequently visited places, visualize routes within a specified period and pinpoint common locations of several device users. The messages section gives investigators access to SMS, MMS, iMessage and E-mail messages (with the attachments) in the device. Investigators can read conversations either in Table or a visual Chats view. The export button allows can be used send all or selected messages with attachments to data reports directly from this section. The Organizer section displays the detailed information about calendar events, notes and tasks. The program can decrypt notes created and encrypted in Apple devices running iOS 9-12 Data reports can also be customized and generated in any of supported file formats directly from this section. The Passwords section displays logins, passwords and tokens extracted iOS, Android and Windows Phone devices. The program decrypts credentials from the iOS keychain, finds them in application databases and web forms. Investigators can find passwords to various application accounts as well as passwords used to connect to WiFi networks. The Phonebook section presents the complete information about the device's contacts - phone and SIM card contacts, their standard and customer fields, speed dials and birthdays, creation and last modification dates. The section also offers rich sorting and filtering capabilities and allows investigators to generate data reports with all or selected contacts. The built-in Oxygen Forensic® Plist Viewer offers advanced analyzing of Plist files: investigators can open plain XML and binary XML files, view entries according to their type (string, data, numbers etc. ), convert values, open external files for analysis, export .plist file data in XML format for further analysis by external tools. 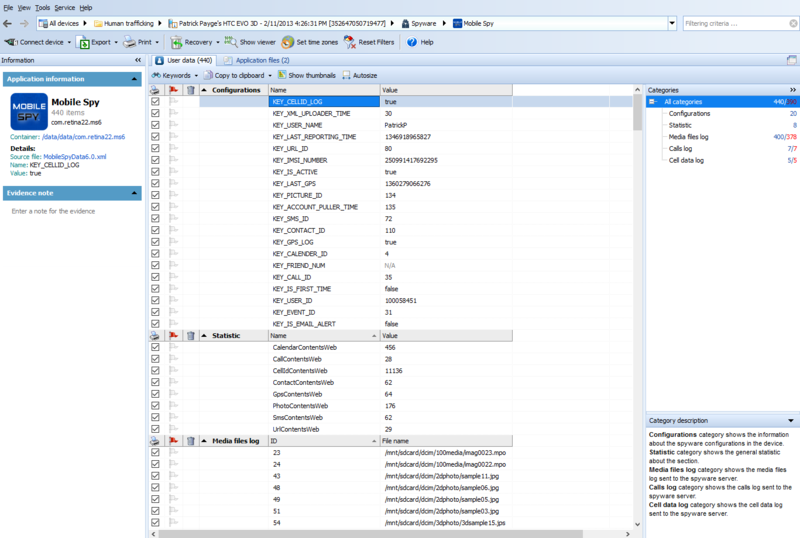 The built-in Oxygen Forensic SQLite Viewer is a powerful tool for examining SQLite files and their contents. With this tool, investigators can open any SQLite database, recover deleted records, convert values to a readable format, build visual SQL queries and save them for further use, run search and finally export selected entries to customization data reports. The Screen Lock Disabler allows the investigator to disable user lock code on supported LG devices based on Android OS and gain access to critical data. The procedure takes several minutes and requires no special cables or tools. 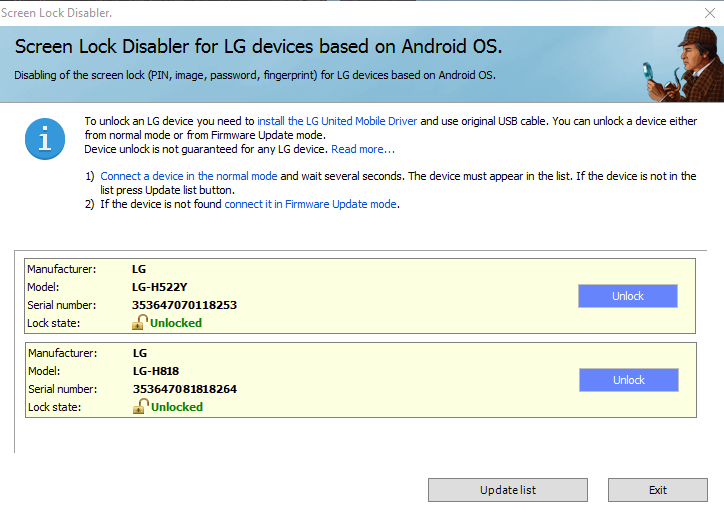 Simply install the LG United Mobile Driver, insert a regular USB and let the software disable the lock. Oxygen Forensic® software can detect spyware apps installed on Android and Apple devices, discover and process their logs and configuration files. Spyware log files may include application configuration data, the list of running services, application username, sometimes accompanied with a unique code allowing to detect the app, Cell ID used at the time of data transmission, and GPS logs accompanied with Geo-coordinates and a timestamp. The Timeline section summarizes all events in chronological order: calendar events, messages, calls, web cache, web connections, voicemails, photos and videos history, etc. The section offers investigators a number of powerful filters and convenient data presentation modes that allow them to concentrate on the analysis of the pertinent data only. Timeline also contains an Activity Matrix, often called a Heat Map, that displays heavy usage by a single user or multiple users.